After the Department of Consumer Affairs declared restaurant service charge as an unfair trade practice last year, the Central Board of Direct Taxes (CBDT) has asked the Income Tax Department to examine the books of restaurants to see if there is any under-reporting or non-reporting of service charge collected by them. Per consumer reporting in the Department of Consumer Affair circle on LocalCircles, some restaurants are still forcefully adding service charge to the bills of their customers despite the advisories issued by the Department of Consumer Affairs to make Service Charge optional. 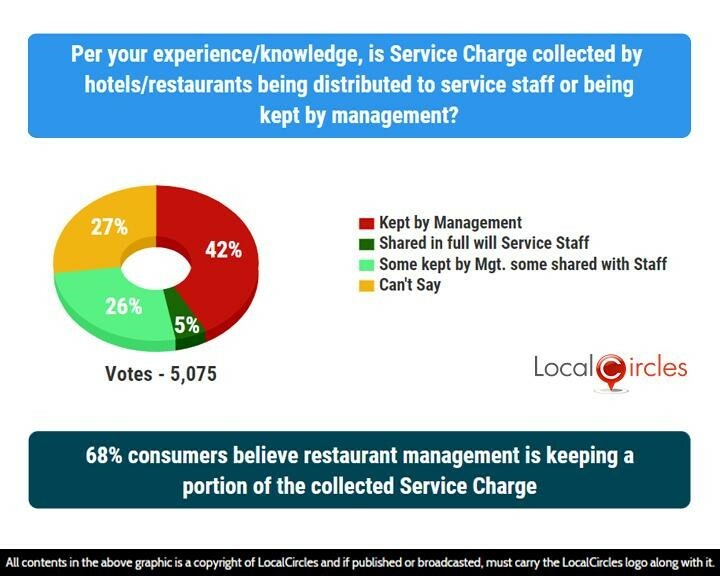 A LocalCircles poll asked consumers about their thoughts on service charge that was collected by hotels/restaurants. Only 5% said it was fully being distributed to serving staff, while 42% said it was being kept by management. 26% said a part of it was shared with the staff and the other part was kept by the management. 27% were unsure about it. 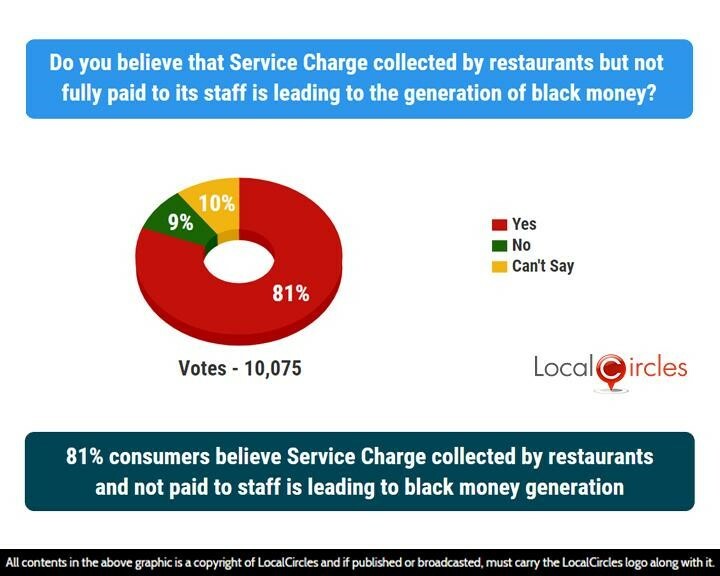 The following poll in which 10,075 consumers voted, showed that 81% consumers believe service charge collected by restaurants is not fully paid to its staff is leading to the generation of black money. CBDT also said that service charge collected by restaurants but not passed on to the staff will be liable for taxes under the income tax rules. 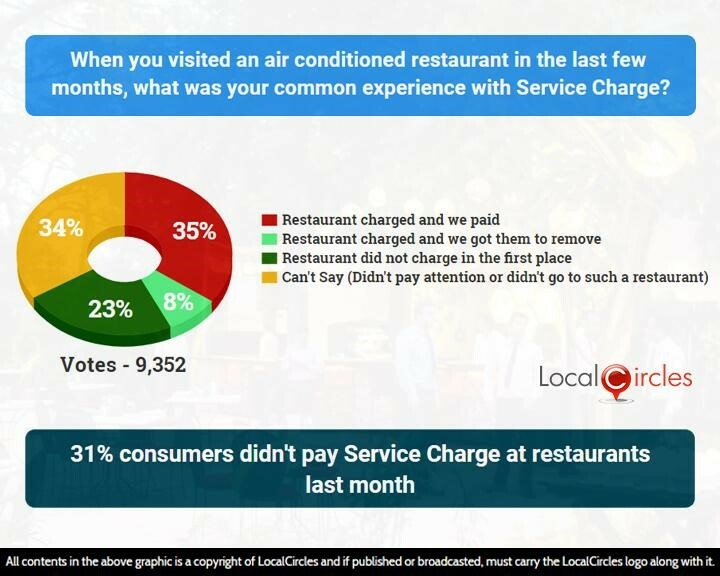 In the next question, 35% consumers said that when they visited an air-conditioned restaurant in the last few months, the restaurants charged them a service charge flat out, while 8% said that the restaurant charged it, but they got it removed. Only 23% said the restaurant did not charge it at all and 34% did not pay attention to the bill. This poll got 9,352 responses. 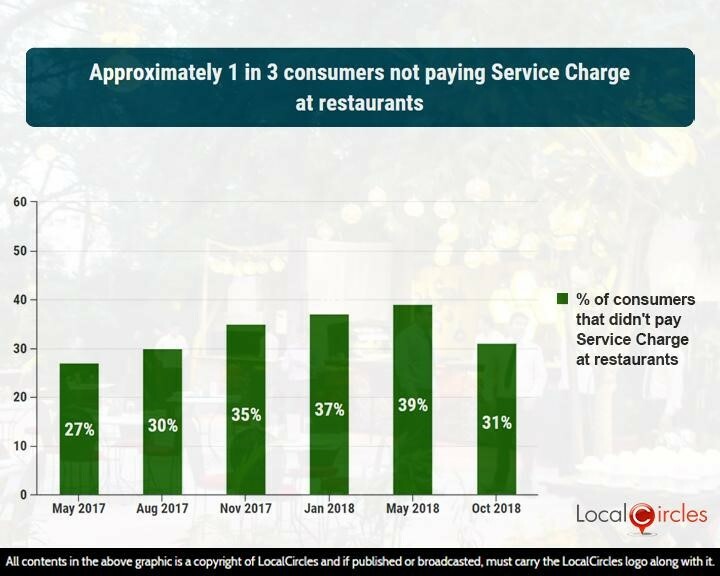 Approximately 1 in 3 consumers haven’t been paying the Service Charge and for the first time percent of consumers saying that the restaurant did not demand a Service Charge came down in October 18 survey. The number was constant in the first two quarters of the year at 27% and came down to 23% in the October survey. LocalCircles has been constantly mapping the service charge issue for the last 6 quarters. According to the October 2018 pulse check, 31%, i.e. approximately 1 in every 3 consumers, did not paying service charge at restaurants. 89% consumers in a related poll had earlier said that the practice of service charge at restaurants should be completely abolished. The decision by CBDT will definitely turn the tide in the consumer’s favour and would lead to more and more hotels and restaurants stopping charging a service charge to customers. Many consumers since the notification have welcomed the notification by CBDT and said most restaurants would not want a tax scrutiny because of Service Charge.